This product uses internal magnetic speaker to avoid noise and ensures pure sound quality, bringing you a feast of listening. Unique phonograph appearance design, fashionable and tasteful. Use vinyl records and levers to adjust the music volume and switch songs. Colorful lighting, surface brushing effect and multi-level color matching, it is an indispensable choice for your home and office. Multiple power supply modes, such as Mobile power, computer USB, adapter DC-5V, let you enjoy music anytime, anywhere, relax and decompress. Use high-fidelity amplifier with boost, perfect to restore high, medium and low sound, let this mini speaker emit high-quality music effects. 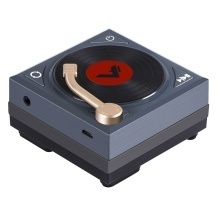 New concept retro style digital speakers, connect your phone, tablet and other functions at any time, let you choose different ways to enjoy the music.